Our spring concert will be at The Stoller Hall – Manchester’s new concert venue which opened in 2017. This magnificent venue is part of the Chetham’s School of Music. Songs by Drennan, Stopford, Whitacre, Arnesen, Stephens, Stainer, Lauridsen and Gjeilo. 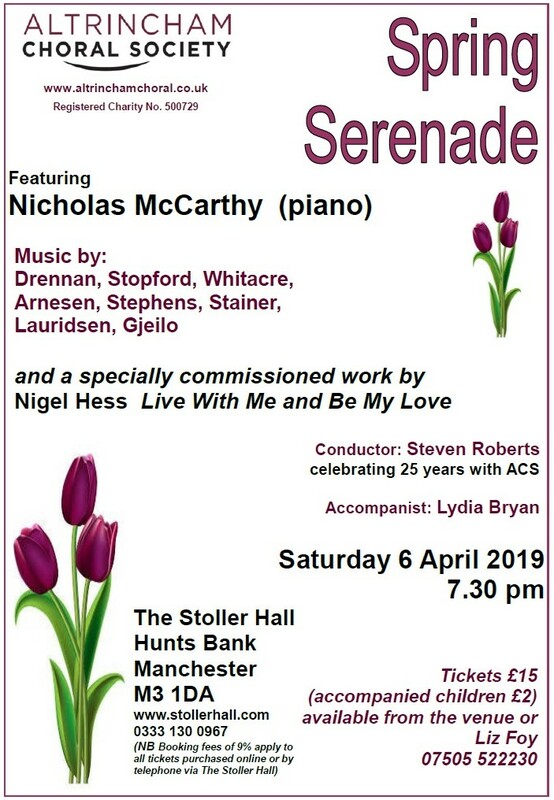 We are also delighted to be welcoming one-handed pianist Nicholas McCarthy to play with the choir a specially commissioned work by Nigel Hess – Live With Me and Be My Love. Further information about the pianist Nicholas McCarthy can be found on his website here. Nigel Hess is a well known composer – particularly for his choral works. Further information can be found here. Further information on how to purchase tickets via The Stoller Hall can be found here. All prices include a 9% online booking fee charged by the hall. Tickets without booking fees are available (February 2019 onwards) via the choir for £15 and accompanied children £2.